Added a new resize mode for shapes: "Scale To Fit" which helps if e.g. source images sometimes come in landscape or portrait mode. In these cases Scale to Fit ensures that the source image remains within the dimensions of the target shape while keeping the aspect ratio (i.e. no scaling distortions). Cf. screenshot below where Resizing is currently set to "Scale to Fit" (4-way arrow). 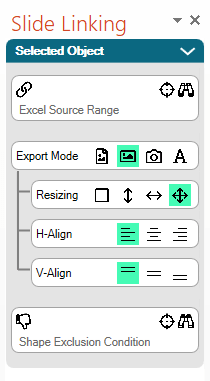 Added a new feature to help positioning in export mode "Indirect Shape" both vertically and horizontally (cf. screenshot below "H-Align" and "V-Align") . It is now possible to decide between left, center, right and top, middle, bottom alignment in case the picture does not fill the whole target shape dimensions. This might particularly be the case when using resize mode "Scale to Fit". Improved performance for larger Excel files with many larger Excel tables. Improved notification for user when shapes or charts to being exported were incorrectly addressed. SlideFab will write a notification into respective target shapes. Merged cells when exporting tables led to incorrect duplicate content in merged cell areas. Sometimes custom Powerpoint presentation designs can get corrupted. In these cases SlideFab ceased making slides. This is now fixed, although the corrupted design might not work after all. 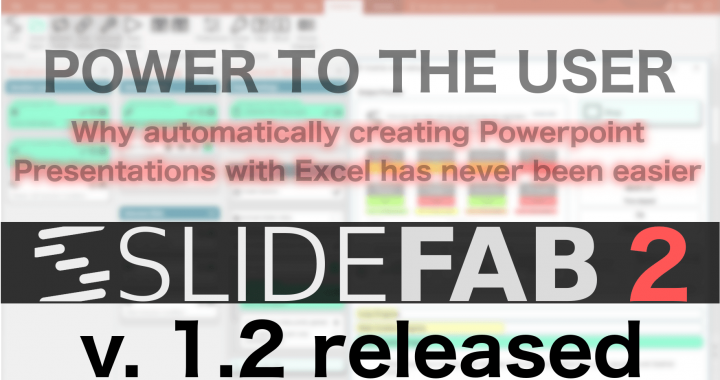 Posted in New Version and tagged Bugfix, Excel, New Version, Powerpoint, SlideFab 2, Update.